Modern Fit. Order One Size Larger for Regular Fit. 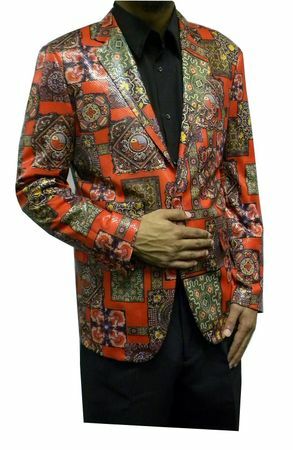 If you want a unique style fancy blazer for either performing on stage or just because you simply have to have all eyes on you when you enter the scene, this red medieval pattern fancy blazer by Pronti will do it for you. Featuring a modern fit style with notched lapels in an Italian cut that is well tailored, this head turning fancy blazer will be impossible not to notice. Features a center vent in the back and rich french faced lining. This fancy style blazer will also look great with jeans as well.